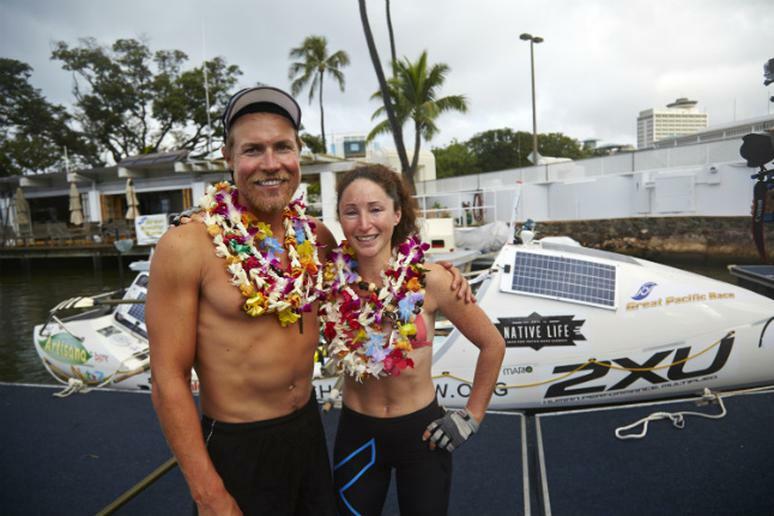 The couple stands in Hawaii on Aug. 2 after completing their 2,765 mile journey. How far would you go to raise awareness and funds for a meaningful cause? One California couple, Meredith Loring and Sami Inkinen, traveled more than 2,765 miles across the pacific to bring attention to the high levels of sugar in American diets. In the process of rowing across the Pacific for their cause, the couple managed to raise more than $200,000 for the Institute for Responsible Nutrition and also managed to break the previous couples speed record. Prior to rowing from Monterey, Calif. to Honolulu—60 miles a day for 45 consecutive days, Loring and Inkinen were successful in other fitness realms. Loring won her category in the Mount Everest marathon in June and Inkinen is an age-group triathlon world champion. Inkinen, who is also co-founder of the online real estate site Trulia, was the one who came up with the idea of rowing the 2,765 miles on a sugar-free diet. Neither of them had any rowing experience. A few years ago, despite being an experienced triathlete, Inkinen found out he was pre-diabetic. In order to avoid diabetes, Inkinen switched to a diet free of added sugar and stopped eating most processed foods. He has been working to inform people of the dangers of sugary diets and the rowing challenge is his latest means to get the information out. “We are thrilled with this accomplishment and our ability to continue to highlight a cause so near to our heart and inspire many others to consider what is a truly healthy diet,” said Inkinen. On the trip, the couple was on a diet of fat and protein, without processed carbohydrates. They ate nuts, dried fruit, dehydrated vegetables, meats, fish and oils instead of the sugar-filled energy gels and sports drinks that typically accompany major endurance feats. Completing the challenge and breaking the speed record gave the couple confirmation that their sugar-free diet was the best choice. “This has been an adventure of a lifetime, and we really wanted to demonstrate that you can not only survive but thrive during this sort of adventure by eating only real whole foods,” said Inkinen. The couple is returning home to find other ways to work toward eliminating childhood obesity and type 2 diabetes. To see more on their adventure visit Fatchancerow.org.